Northants captain Alex Wakely has expressed his doubts about the new Twenty20 tournament that is set to be introduced by the ECB. The competition, which would begin in 2020, would involve eight city-based teams and it is hoped it will rival the likes of the Indian Premier League and Australia’s Big Bash. Squads of the eight T20 teams would be made up of 15 players and include three overseas players. That would see a total of 96 players being picked from the 18 counties, which works out at around five men from each. Earlier this week, the ECB announced that its board had given its unanimous backing to begin the formal process. That means that in the year 2020, both the current NatWest T20 Blast competition and the new city-based one would take place, with the eight-team shootout following on from the Blast. However, Wakely, who captained Northants Steelbacks to glory in the Blast last summer, has his doubts about the new tournament. And he said: “I’ve got mixed emotions on it. “One of the key things people aren’t quite understanding is that the ECB are not targeting the same audience that already watches cricket. “The reason they’re doing this is to try to attract a new audience, and that is young kids coming through. “It’s not necessarily trying to attract the cricket lover so the fans are going to be very disappointed about that because they see it as trying to take away the establishment that it already is, but the ECB aren’t really worried about that because they’re trying to get this new audience in. “That way they bring in new sponsors, new clientele, so from that point of view I can understand why they’re doing it. But personally I don’t think it’s going to work. “They’re trying to make it something like a Big Bash and it’s never going to work. “Over there (in Australia), they’ve got the weather, they’ve got the city-based teams already, whereas we’ve got a very different setup in England. Wakely does see the new tournament bringing some positives, but maintains his uncertainty about how it will all pan out. “What is good about it is that it gives the players another chance to compete in a national tournament like the IPL, the Big Bash, and this tournament is going to run alongside that,” Wakely added. 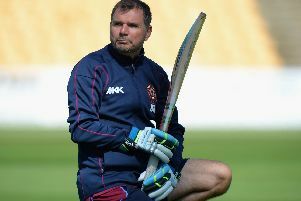 “It’s going to be a source of extra income for the players because if we lose three players from Northants, they will be paid by Northants but also earn some money and get a chance to put themselves on the international map.